Walter “Wally” Garlock’s career in the automotive industry started from humble beginnings at a Milwaukee service station--earning a meager wage of $1.15 per hour. Of all the jobs that were available to him, this service station attendant position was most attractive. It presented several challenges--pumping gas, sweeping, shuffling in oil-dry--that would become the foundation for his development as an industry leader in the auto repair business. It was never about the money. It was always about his passion for automotive service and technology that drove him to his purpose. That purpose waited for him through several years, including two years of military service. When Wally returned home, he resumed employment at the same station, only it was under new ownership. With more responsibilities and promotion to full-time status, he was able to learn and experience at an accelerated rate. He wasn’t just focused on auto service, but he was also learning about running a business. On November 15, 1973, Wally opened Silver Lake Shell in Oconomowoc, that had a two-bay garage, two gas pump islands, and offered minor auto repair services. Throughout the first year of business, Silver Lake Shell continued to grow and add to its family of customers. In July of 1975, the business added a tow truck to its list of services and joined the competitive Oconomowoc area’s towing market. Over the next ten years, Silver Lake Shell became a staple in this community’s automotive service industry. The success of Silver Lake Shell led Wally to pursue other business ventures that ultimately yielded only moderate success. To mitigate losses and prevent long-term financial setbacks, Wally closed Johson Creek, his second business venture. However, he still had a drive to duplicate the outstanding success of Silver Lake Shell. In October 1990, after restructuring and conversion of all business assets and liabilities Silver Lake Shell, Incorporated was created. Wally soon went searching for a new location and began negotiations with Mart Olson for the leasing of a new facility at 36355 E. Wisconsin Avenue in the Village of Oconomowoc Lake. By February 15, 1991, the lease was signed and preparations for relocation began. The next thirty days involved extensive cleaning, equipment restoration, building, and workspace improvements. On March 15, 1991, the property at 224 E. Wisconsin was closed and Walter, along with all his equipment and inventory headed east to 36355 to reopen on the following Monday as Silver Lake Auto & Tire Centers. Our most recent location in Brookfield, WI offers the same quality service, honesty, and integrity for which we’ve always been known. Silver Lake Auto Center in Brookfield is a full-service auto repair facility. Our technicians perform exceptional services for all makes and models, both foreign and domestic. 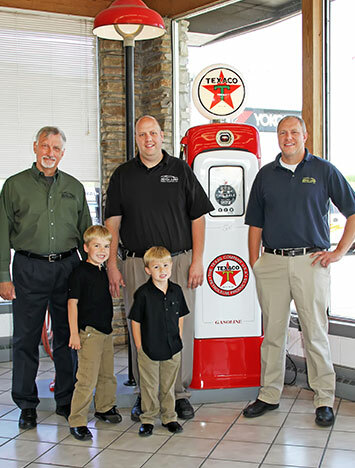 Walter G. Garlock as president of Silver Lake Auto Center, Inc., is teamed with his sons Dan, who is the general manager overseeing the corporation, and Darren, service manager in Hartland. Together, they are ready to serve the needs of the lake-county area drivers and vehicle owners. Next time you’re in the area, feel free to stop by to meet our experts. The new business realized immediate growth beyond projections. Sales doubled, and so did the staff, leaping from two full and three part-time employees to a total of ten within the first year. This growth continued over ensuing years, necessitating further physical accommodations. In the fall of 1997, Wally purchased the business property from Mart Olson, and in 1998, the assets of C&J Towing from Ralph Schmidt, and then merged that business into Silver Lake Shell, Inc. The vacant lot east of Silver Lake Auto & Tire Centers was also acquired a year later. In March of 2005, SLAC took over the used car sales portion of the business from Mart Olson specializing in late model light trucks and SUVs.No longer in the gas pumping trade, but providing quality comprehensive automotive service and sales, a corporate name change was in order. So that same month of March, 2005, the name Silver Lake Shell, Inc. was changed to Silver Lake Auto & Tire Centers, Inc., a name much more definitive of its present existence. Today, forty years of learning, progress, and hard work have culminated into Oconomowoc’s most experienced and consummate automotive service center. Employing ASE master and multi-area certified technicians, SLAC applies state-of-the-art technology to provide guaranteed service under the company’s, as well as various manufacturers’ and service affiliates’ warranties. In addition to its local Better Business Bureau standing, SLAC holds memberships with the nation’s foremost automotive aftermarket leaders, including ASE, American Car Care Centers, AAA, and more. SLAC is also Oconomowoc’s and Hartland’s top dealer in the most popular name brand tires. Dan Garlock, teamed with his brother Darren, are ready to serve the automotive needs of the lake-county area. Armed with three locations in Waukesha County, they are prepared to serve local drivers and vehicle owners with quality, honesty, and integrity. We opened our new location in Brookfield, WI in July 2017. This modern facility mirrors our Oconomowoc and Hartland locations and is equipped with the best and latest equipment, to ensure we are able to perform any repair to the manufacturer's specifications. Our technicians have also been trained to provide quality auto repair and excellent customer service.